Did your windshield lose a fight with a rock? Did your door glass just “mysteriously” shatter? No matter what happened to your vehicle’s windows, Kryger can help. We’ll even come right to you, at home or work. We also fix every other type of glass in your car, like side mirror repair. We’ll even take care of your broken power or manual window system. Cracks or chips in your front or rear windshield that can’t be repaired means your entire windshield will need to be replaced. Same goes for shattered or compromised auto glass like a window or sun roof. When you set up your appointment, whether we come to you or you stop by the shop – the results are the same: High-quality glass installed by expert technicians using the best materials. After all, proper installation of your windshield or auto glass is a must if the glass is to do its job. And we don’t take your safety lightly. We also don’t cut corners – and neither should you. Don’t wait until you fail inspection to get your auto glass replaced. We’ll handle all the communication and paperwork with your insurance company, so all you have to do is set the appointment. We even make it easy to get a quote. You just need the year, make and model of your car. Then tell us which window needs to be replaced. When we first start driving, we’re given a lot of safety advice. Buckle up, eyes on the road, hands at 10 and 2. All of these things work together to keep us safe while driving. But there’s one more thing we need to start adding to that list: Fix your cracked or broken windshield and windows. The fact is, your windshield and windows are there to do more than just keep things out. They’re meant to keep you in – and in one piece – if you’re involved in a collision. Your front and back windshields support your roof during high-pressure situations. If it’s compromised, during a rollover, your car’s roof can cave in. A front windshield is there to absorb and redistribute the impact of a front-end collision. If it’s damaged, it won’t be able to do its job. If your airbag deploys during an accident, your windshield is there to reflect the airbags so they can do their job. If it can’t handle the impact of your airbag, then the airbag can’t help you and it will be a danger to you. Front windshields use laminated glass which makes the windshields less likely to shatter. But a crack deep enough to reach the inner lining can cause the lining to wear out over time, turning your safety glass into a safety hazard. 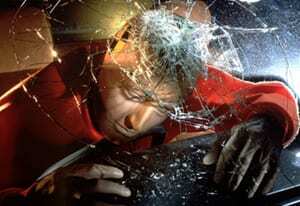 Your windows are there to support the airbags and keep them in place when they deploy during an accident. The airbags will turn dangerous if they aren’t properly placed. When you’re driving and you hit a large pothole or a small piece of rock hits your window, it can suddenly shatter. This is a scary experience for the driver and could end up causing an accident. A cracked sunroof will eventually break apart into tiny pieces. These pieces, regardless of the gummy material, can be very sharp. You don’t want to be driving when it finally breaks. An existing flaw in your rear windshield can cause it to shatter in very hot or cold temperatures, or from a large jolt. Again, you don’t want to be driving when this happens. The auto glass that makes up your vehicle’s windshields, windows, and sunroof are there to keep you and your passengers safe in many situations. If the glass is damaged or compromised, it can’t do the job. Don’t wait until it’s too late to get it fixed. Protection isn’t pricey – but not protecting you and your passengers is.